I am so behind on food blogging that I’m a little embarrassed. In my defense, work and home have been very busy. Easter was great and church was great (despite having a 24 hour migraine). My husband surprised me with lovely Easter roses and I surprised him with an Easter egg hunt! 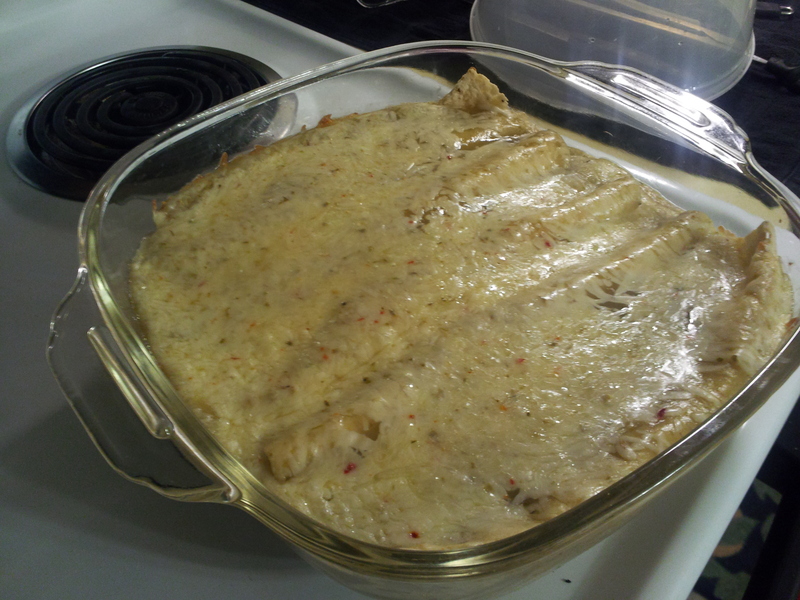 In any case, I have so many recipes and photos backed up, I will just pick up right where I left off, with these green chile enchiladas, which was passed on to me by my friend Alysha. I’ve only had enchiladas with green sauce once or twice, and I’ll be honest, I prefer the red sauce, but these were tasty, and a nice change of pace! They made 7 enchiladas, which my husband and I used for work lunches. -Combine shredded chicken, cream cheese, garlic, chili powder, cumin, kosher salt, black pepper, lime and green chili in a medium sized bowl. Stir until combined. -Spoon a little into each tortilla and roll up. Place a little enchilada sauce on the bottom of a 9×13 dish and then put the tortillas in. -Pour the rest of the enchilada sauce over the tortiallas and top with shredded cheese. Cover with foil. We made this a total of three times. Once, according to recipe. 2nd time, with refried beans added. 3rd time, with black beans (whole) added. The black beans whole were PERFECT and made the enchilada really filling. However, this means I ate them nearly every day for 3 weeks so I haven’t been able to finish the last batch because I ate so many! But they were so good! And froze SO well! !